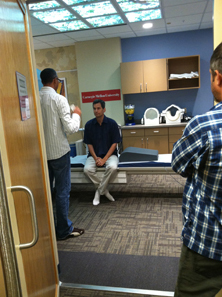 NOVA host David Pogue preparing for an fMRI scan. The Nov. 14 episode of NOVA ScienceNOW, "What Will the Future Look Like?," will feature a report on thought identification research by Tom Mitchell, head of the Machine Learning Department and Marcel Just, professor of psychology. In Pittsburgh, ScienceNOW airs at 10 p.m. Wednesdays on WQED. A preview of the episode can be seen here. In August, host David Pogue and a production crew visited CMU's Scientific Imaging and Brain Research (SIBR) center to learn more about thought identification research. Mitchell and Just have applied machine-learning techniques to brain imaging data to identify an individual's thoughts of concrete objects. For the episode, Pogue went through the experiment in the center's fMRI scanner on the third floor of Wean Hall. In the standard experiment, Pogue was shown ten pairs of objects two times while in the fMRI. With the cameras rolling, the brain analysis computer then correctly identified each object that Pogue had been thinking about. At Pogue's urging, however, Mitchell and Just agreed to run a variation of the experiment: instead of having one computer show an object to Pogue while another identified his thoughts, they allowed Pogue to decide on his own which of two objects to think about in 10 tries. After the experiment, they compared his notes with the computer's analysis. "We were all nervous about trying this experiment for the first time with the cameras rolling," Mitchell said. "But, we had seen before that our computer model had successfully predicted neural representations for new words, and that these neural representations are remarkably similar across different people." Happily, the computer correctly identified all ten objects that Pogue thought about.